The Commonwealth Scholarship Commission in the UK offers scholarships to students from developing commonwealth countries to pursue Ph.D. or Master's program at a UK university with which the CSC has a part funding agreement. 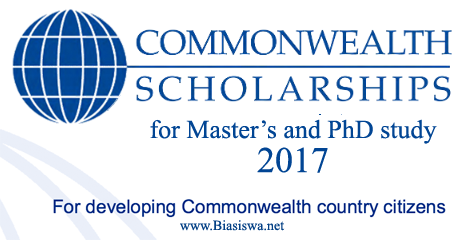 The applicants for Commonwealth Scholarships for Master's and Ph.D., 2017 should be citizens or permanent residents of a developing commonwealth country, or refugee or a British protected person. The candidates should be able to start their studies in the UK at the start of the academic year. The applicants should have upper second class honor or a second class degree or a master's degree. The candidates applying for Commonwealth Scholarships for Master's and Ph.D., 2017 should apply to a UK university with which CSC has a part funding agreement. The applicants should apply to nominating bodies in the first instance. The candidates should submit academic transcripts and certificates, two references and for Ph.D. candidates a statement of support from the supervisor from the UK from the institution named in the application. The applicants for Commonwealth Scholarships for Master's and Ph.D., 2017 are evaluated based on the quality of the plan of the study. The candidates are assessed based on their academic merit and the impact of the work on the development of the applicant's home country. The recipients of Commonwealth Scholarships for Master's and Ph.D., 2017 get tuition fees and examination fees. The successful candidates get a stipend of £1,043 per month or £1,279 per month for living in London. The applicants who are selected will get thesis grants, warm, clothing allowance, airfare from the applicant' home country to the UK and study travel grants. Very nice blog.You discuss about Commonwealth Scholarships for Masters. Thanks for the post.read here i found great information. Definitely share it to others. Maybe you can do topics bout latest technological news. You have a great way of writing. I am interested in software advancements. Thank you very much.